Brides are stepping out in style and dressing up their feet in fabulous foot jewelry. They're kicking off their shoes and wearing barefoot sandals (also known as "foot thongs," "foot laces" or "footlets"), toe rings and anklets, along with foot and ankle henna, foot tattoos and toenail art. Read on for design inspiration and style tips for everything you need to put your best foot forward on the big day (minus the pedicure). Brides are breaking in barefoot sandals for beach and garden weddings. Inspired by ancient Egyptian jewelry, these beaded straps, chain or jewelry worn on the toes and ankles offer a stunning way to decorate feet, allowing brides to leave uncomfortable heels behind for a stylish walk down the aisle. Perfect for the entire bridal party and special wedding guests, barefoot sandals are easily customized to include wedding colors or special design elements. Barefoot sandals are also great to pack for the honeymoon as they can be worn on the beach and with sandals or shoes for a night out on the town. Design with Swarovski crystal and Swarovski crystal pearls, cultured freshwater pearls, Czech pressed glass beads, seed beads and more to match any style of wedding. View a selection of barefoot sandal design ideas for creative inspiration. More and more brides are saying "I do" to toe rings as a must-have wedding accessory. Recognized by some cultures as a symbol of the married state, toe rings make a beautiful addition to any big day celebration. Brides are wearing multiple toe rings and also combining them with anklets or barefoot sandals for on-trend wedding looks. 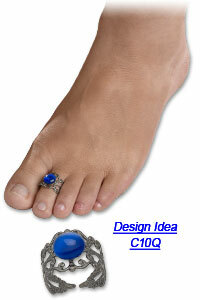 Adding a little something extra to feet, toe rings also make great bridal party spa day gifts or wedding favors. Brides can make their own by using adjustable flat pad toe ring bases and adding stones, or shop from Fire Mountain Gems and Beads' wide selection of finished toe rings. Priced to fit any wedding budget, brides can find everything from precious metal toe ring bands, to toe rings with meaningful symbols such as the Claddagh, to sparkly crystal designs in floral and butterfly motifs. Fire Mountain Gems and Beads also offers toe ring mixes including multiple styles of toe rings, making it easy and super economical to outfit the entire bridal party. 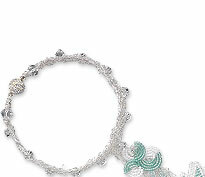 Anklets play an important role in wedding jewelry as brides look to dress up their feet in a fun and fashionable way. A style that dates back thousands of years and holds significant meaning within certain cultures, ankle bracelets are a beautiful way to accessorize on the big day. Depending on the mood of the wedding, anklets can range in design from a simple chain to a chunky statement with bells and beads. Ankle bracelets can be worn on one, or both ankles and brides can wear a combination of anklets for a multitude of style options. Anklets can be worn tight on the ankle like a leather strap or may dangle an inch or two. For jewelry-making purposes the typical anklet size is 9 to 9-1/2 inches and extender chains can be incorporated for more sizing flexibility when the exact size is not known. Leather, nylon, braided and beaded anklets are popular choices. For example, a beaded leather anklet is a smart selection for a bohemian-style bride and a luxurious gold chain anklet with Swarovski crystal makes a pretty addition for a glamorous bride. Special charms and meaningful beads, such as initials or birthstones, can be incorporated into anklet designs for the ultimate in personalized wedding jewelry. Make anklets for bridal party gifts and special guests that'll keep everyone dancing all night long. Browse a variety of ankle bracelet design ideas to find a look for all. Looking for additional ideas for designing bridal foot jewelry? View photographs of foot jewelry shared by customers in Fire Mountain Gems and Beads' Customer Photographs for more options.